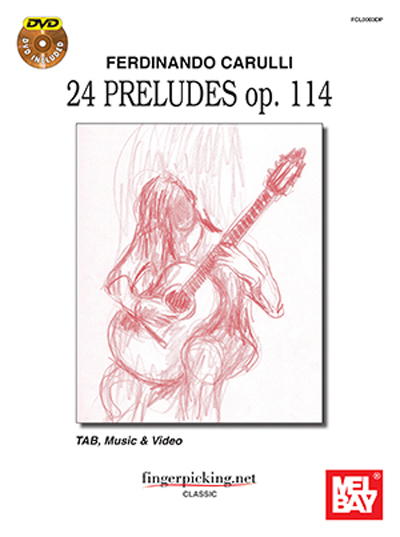 This unique series features a collection of the most famous pieces from the classical guitar repertoire, and includes music scores, tablature and accompanying video. Great care has been taken to verify the fingerings of both hands in the material. Innovative tablature combines left-hand finger positions with rhythmic notation, allowing the reader to tackle very complex musical repertoire and polyphony. Therefore, this system provides an opportunity for anyone to learn pieces from these great composers, regardless of reading ability.Ferdinando Carulli was a prolific and influential composer for the classical guitar. He is not as well-known as Guiliani, Carcassi, Sor or Aguado, mainly because his most famous pieces are short studies for the guitar. However, Carulli composed over 300 pieces during his life, including duets and full-fledged compositions. Nonetheless, Carulli achieved his greatest success through his simple studies, which continue to provide beginners with an excellent approach to the classical guitar.